Stranded on the Roof with my Pregnant client! Everyone who knows me knows how much I love San Francisco! Being a photographer, what’s not to love with all of the amazing photos opportunities, everywhere you turn. 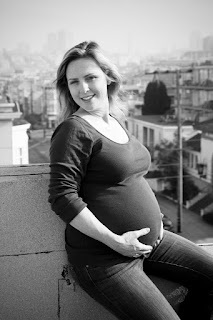 My client Rachel told me that she would love to do some pregnancy shots on her roof, in the Marina. She said she had easy access to the roof with sweeping views of the bay. I was so excited to have a new place to shoot. We proceeded to climb up the interior stairs to the roof. She said that the door was rigged so it would not lock you out, but she would bring her keys anyways. We went out onto the roof and the door closed behind us. It was a bit windy, so we thought we would do the indoor shots first, then come back up. We pulled on the door and it did not open. The duct tape that had blocked the hole, so the lock wouldn’t latch, had worn a hole right through it! I thought duct tape was indestructible. Rachel tried the key, they had changed the lock! We realized that Rachel did not have her phone with phone numbers in it, to call a neighbor to come help us. I had my phone, but no one really to call. We tried to yell down into the light well, but no one heard us. We laughed and though how it would sound to call 911 to tell them we had a pregnant lady on the roof for a photo shoot and we were stuck on the roof, with no way to get down! We decided to work on picking the lock. Ironically, I had just finished a book called “The Spellman Files” that morning. It is about a woman private investigator and she picked a lot of locks. It was very ironic! Rachel used her Gold’s Gym plastic card and I pushed the door as far as I could so we could slip the card in between, and lo and behold, we opened it! What a relief! We went on with our shoot, and returned to the roof when the wind died down. We propped the door, to be sure it would not close, and went on to get some fantastic shots on her roof, with my favorite city as our backdrop! I will never forget this shoot, that is for sure. Rachel was a great sport and didn’t panic. She is going to be a great mom!